Can you remember recruitment before social media? No? You’re not alone. Although social media has barely been around 20 years, its influence on the recruitment industry has been huge. It’s changed the way we source candidates, the way we attract clients and the way we brand our agencies. In this article, we’ll be looking at the extent to which social media has impacted the recruitment agency market. How and why recruitment agencies use social media. How effective recruitment agencies are at using social media. The benefits of social networking for recruiters. Should recruitment agencies invest money into using social media? Before we delve into the present day, let’s take a quick look at how we got here. Want to get straight to the nitty gritty? Scroll down to read about how social media has affected the recruitment industry. Although unrecognisable from today’s modern platforms, the concept of online sociability first emerged in the 1970s and 1980s. These maiden steps into connectivity, such as Bulletin Board Systems (BBS), were popular with early computer adopters and allowed many of the same basic functions as today’s social networks (message posting, file sharing etc.). While traffic to these rudimentary hubs remained fairly high until the mid-1990s, limited access to computers (and an even less widespread knowledge of coding) meant that these early systems were largely out of reach of the everyman – but not for long. Coupled with technological progress, the launch of the World Wide Web allowed social media, amongst other things, to begin its journey into the mainstream. Do you know what the first real social media site was? Well have you ever heard of Six Degrees? Six Degrees, launched in 1997, is widely regarded as the first social network by modern standards. This wasn’t too dissimilar to Facebook and had a lot of recognisable functions such as ‘friending’ other users and message posting. As technology survived Y2K (remember that?? 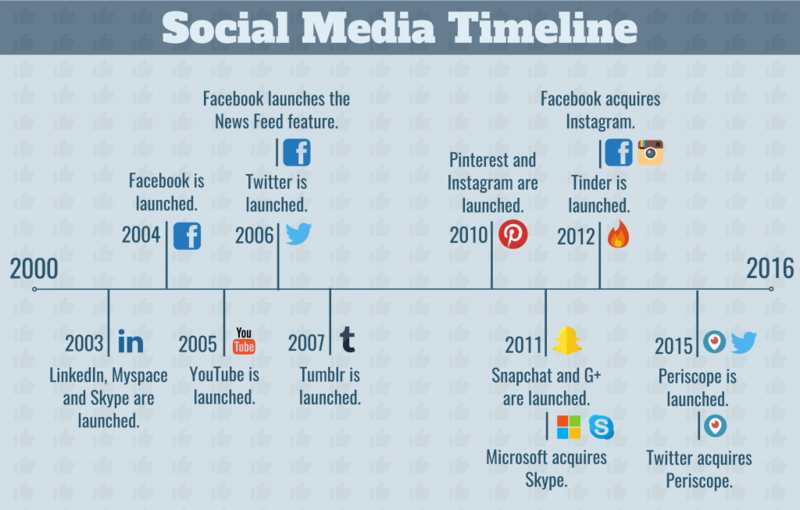 ), the years that followed saw a succession of social media platforms released. Throughout the decade, internet use increased and so did the number of social media users. Fast forward and there are now around 3 billion social media users worldwide (that’s nearly one in three of the world population!). Social media has had a major influence on all aspects of modern life – recruitment included. What was once a mere bullet point in a marketing presentation, is now an integral part of any business plan. But just how much of an impact has social media had on recruitment and recruitment agencies? How many recruitment agencies use social media? It’s thought that around nine in ten recruiters appear on at least one social platform. Put another way, there are over 115,000 people that work within the UK recruitment sector, which would mean at least 100,000 appear on a social network! Which are the most popular networks for recruiters? Recruiters may also tap into other platforms, such as YouTube, Instagram and even Snapchat – depending on their market and brand. Not all social media platforms are created equally though, and when it comes to recruitment, some are definitely valued more highly than others. According to the Recruitment & Employment Confederation (REC), LinkedIn is the preferred network for recruiters, with 94% using it to source candidates. But what if you’re not sourcing candidates? What if you have another objective? Why are recruitment agencies using social media? When looking into the use of social media by recruitment agencies, we wondered why exactly they want to have a social presence. Our Twitter poll showed that the number one reason for using social media was to build a brand. Well, it suggests that recruitment agencies are looking at the long term. Having a strong brand is key in an age where so many agencies are vying for attention. You want to be a consistent voice that your customers can rely on and the go-to place for relevant information. While sourcing candidates and employers offers a short-term gain, developing this kind of brand brings future benefits – including lead and candidate attraction. Put the work into developing a brand and everything else becomes a little easier. 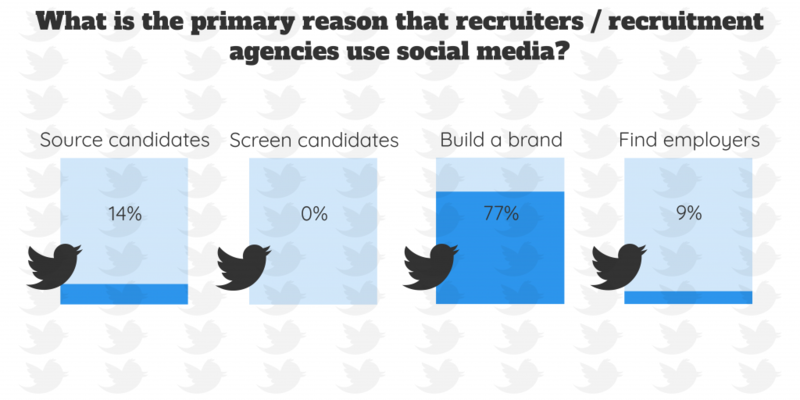 How are recruitment agencies performing on social media? So it appears that recruitment agencies are using social media, but are they using it effectively? When deciding on a social media strategy, often the biggest hurdle is deciding how to measure success. As cash isn’t a direct reward for a strong online performance, agencies need to look at the bigger picture in order to assess the potential returns. How influential are recruitment agencies on social media? Before closing its service in 2018, Klout was a measure of how influential a person or company is on social media. Rather than just considering one or two factors across one or two platforms, it pulled data from a range of social channels to give users an influence score out of 100. Number of retweets or shares. The influence of those that share and mention you. Number of followers or connections. Quality of followers (any spam accounts?). The average Klout score across all social media users was 40, with scores above 50 being considered particularly influential. So how influential was the recruitment industry? 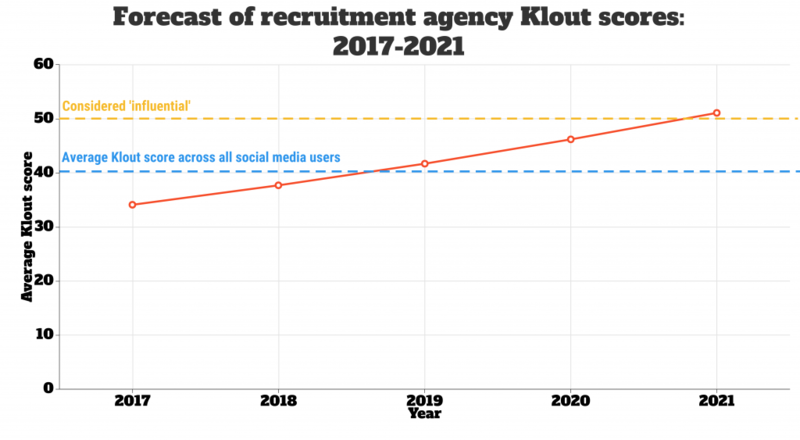 At the time of closing, the average Klout score for recruitment agencies was between 34-40 and had been growing steadily for some time – something we expected to continue. In fact, by 2021, the recruitment industry (by Klout’s standards at least), would have been classed as influential on social media. With so many agencies taking to LinkedIn et al, just what are the benefits to recruiters of using social media? Accessing emerging talent is a challenge for recruitment agencies, especially in industries that are experiencing skill shortages. But did you know that 99% of 16-24 year olds are on social media? Okay, so while this stat might not be altogether that shocking, the 2018 Communications Market Report, produced by Ofcom, has shown that social media is indeed ubiquitous amongst school and university leavers. Social media, therefore, opens the door to a young talent pool – of which 500,000 are unemployed. More than just attracting millennial job seekers, social media can also be used to engage with passive candidates. As the name suggests, passive candidates aren’t actively looking for work, but would be interested in changing jobs if the right opportunity arose. Attracting passive candidates often requires a more tactful approach, and thanks to social media, agencies are able to reach out to this tentative market. With around 40,000 recruitment agencies in the UK, standing out from the crowd can be tough. All this competition has only further cemented the importance of brand building – a task where social media really comes into its own. Social media and content marketing is a growing industry and recruitment agencies are having to adapt their brand building practices to this age of digital connectivity. 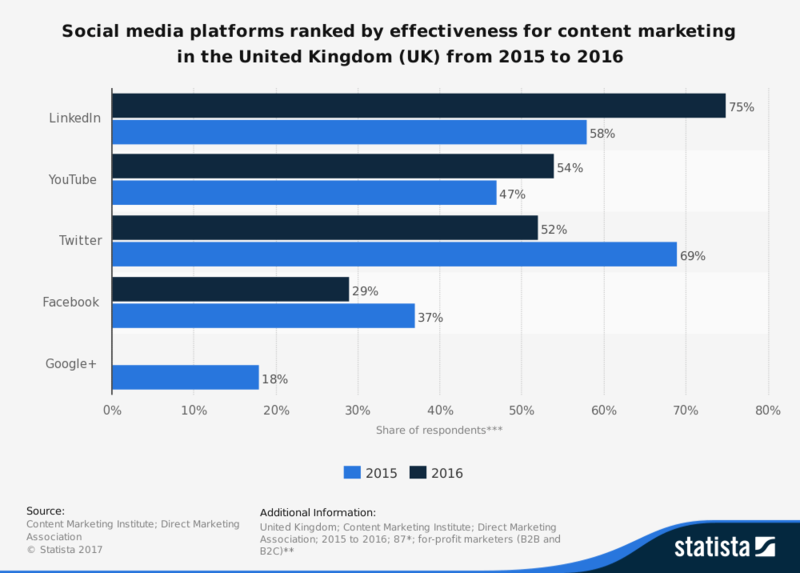 According to the Content Marketing Institute (graph courtesy of Statista), LinkedIn is considered the most effective platform for content marketing, with the influence of Facebook and Twitter falling between 2015 and 2016. COLD CALLING IS DEAD well, kind of. Once a staple of any selling strategy, cold calling has lost its punch thanks to an intrusive reputation and a generation that would rather not pick up the phone. Step forward social media, which is able to take a softer approach towards communicating services to potential customers and help your agency get more leads. Compared with cold calling, which only has a 1-3% success rate, social selling is thought to result in a conversion rate of around 15%. That makes social media around five times more effective than cold calling; you do the maths. It can be tempting to dive straight into social media, but it pays to take a more measured approach. 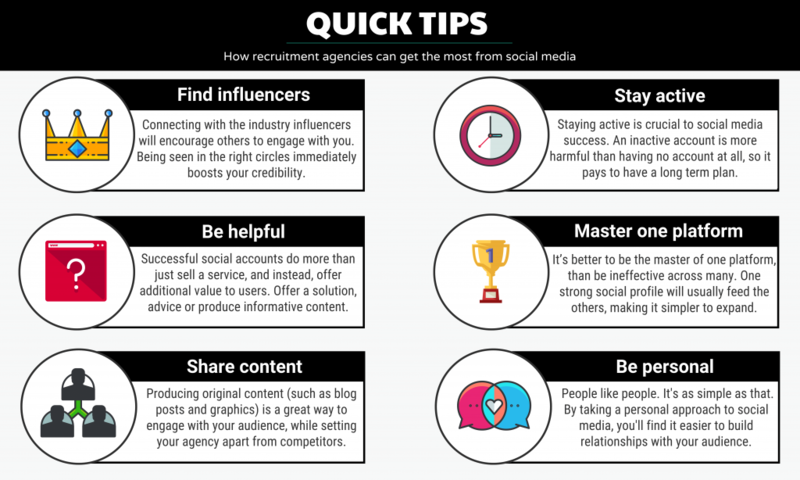 Read our quick tips on how recruitment agencies can get the most from social media. The nature of social media means that everything you do is immediately made public. As a result, recruitment agencies can’t afford to get their strategies wrong. A few poorly thought out tweets or failing to develop a consistent presence, will only reflect badly on your brand and make it harder to land leads. So, I suppose the big question is ‘should recruitment agencies invest in social media?’. In 2014, the UK spend on content marketing was £125 million, and by 2020, is expected to rise to nearly £350 million. Do you want to be left behind? I’m reluctant to put it so simply, but we believe it would be remiss of recruitment agencies to not explore the opportunities that social networking offers them. Should recruitment agencies outsource social media? If you’re new to social media or just don’t have the in-house resources, then handing over the day-to-day management of your profile can be beneficial. Saves time by allowing you to concentrate on what you do best. Prevents the cost of hiring full-time social media staff. Brings specialist expertise into the business. Can increase / decrease commitment as needed. “We are expert recruiters and 100% of our time should be spent recruiting. We have attempted to do our own social media posting, without any planning and without any idea that it would work. As Alan says, recruiters recruit. While they might dabble with social media in their personal lives, using it for business purposes may not be their forte. Outsourcing hands this responsibility over to specialists who understand how to optimise social media activity for business-benefit. Social media is changing the way that recruitment agencies communicate with both employees and job seekers. Whether you’re looking to give your brand a boost or increase your agency’s talent pool, social networks are a valuable resource to businesses and professionals across the recruitment sector. The key to success though, is getting your social media strategy right. Do you outsource? Do you take on full time staff? Do you invest solely in one platform? Do you try and have a presence on all of them? Whatever approach you take, consider your objectives and the resources at your disposal. One thing is for sure though, recruitment agencies will need to learn how to make the most of social media if they are hoping to thrive in an increasingly digital market.